We are not in flavor country, we are in Bava Country. And on this episode of the Really Awful Movies Podcast, Mario Bava’s fun giallo, Hatchet for the Honeymoon. The film was lusciously shot in Barcelona and Rome with the working title Un’accetta per la luna di miele. And Bava completed shooting in October 1969. The setting is wonderful: a sprawling villa with immaculately kept grounds. It follows the misadventures of John Harrington (Stephen Forsyth), who, with the assistance of his estranged wife, runs a boutique wedding fashion house. He tends to a small hot house flower garden as well. John though, has a wandering eye…and also an eye for killing models. As models start to go missing, Inspector Russell begins poking his nose around. Hatchet for the Honeymoon is not a true giallo (there’s no black glove killer, for example, and the killer’s identity is revealed right off the bat). However, there are little touches of yellow flavoring throughout. Fans of Mario Bava will get a kick out of this, and fans of genre film as well. Tune in, and don’t forget to subscribe to the podcast (and tell all your friends). And also, help support the show by picking up a copy of our acclaimed book, Death by Umbrella! The 100 Weirdest Horror Movie Weapons. In this installment of the Really Awful Movies Podcast, the hosts do a side-by-side comparison of these two indelible horror genre films, the 1989 vs the 2019 Pet Sematary. So, what’s the fuss all about? The original, while not a runaway hit, has its backers as well as detractors. While the remake has a whole slew of detractors. Perhaps it’ll take a while for people to warm to it, but that’s unlikely. The story is familiar to most: a cat is run over on a New England highway. And the father, along with a neighbor accomplice, buries the thing only to have it return. The characters are terrific, as well they should be. After all, Stephen King wrote the source novel (and King even wrote the screenplay to the 1989 original). 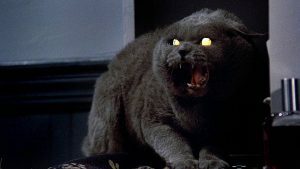 While many of us are sick to death of cat scares, we will make an exception here with Pet Sematary (both films). Church the cat (derived from Sir Winston Churchill) is a bona fide animal star. Even if the movie built around him, is more of an asteroid than a sun. Still, as is the ethos of our podcast, we celebrate as much as we criticize. We hope we were being fair to Pet Sematary, both versions. If you haven’t seen either, do so. And definitely rock out to the stand-out Ramones song of the same name. You’ll be glad you did, and you’ll be glad to listen (we hope) to the Really Awful Movies Podcast.